Schulz says post-Holocaust Germany must guarantee 'the security of Israel,' condemns reality in which synagogues need protection again. European Parliament President Martin Schulz of Germany took part in the fourth International “Let My People Live!” Forum against anti-Semitism this week, where he had harsh words for the recent rise of the racist hate in Europe. "Auschwitz is the darkest point in the history of mankind, and for sure the darkest point in the history of my nation," said Schulz, at the event timed around the 70th anniversary of the liberation of Auschwitz. Schulz stated that there were two important points Germany took out of the period following the Holocaust, with the first being that while Germans born after World War II should not be blamed for the crimes of the genocidal Nazi regime, they have the responsibility to prevent such an occurrence from repeating. Secondly, Schulz said post-war Germany must "guarantee as a German nation and as a state the security of Israel." 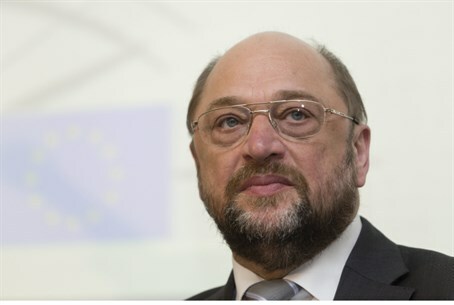 "It fills me with worry that police forces have to protect synagogues once more, not only in Germany but all over in Europe - this is a shame," emphasized Schulz. "This is not acceptable, every Jew must live in security, this is the message 70 years after the liberation of Auschwitz," he added. "Anti-Semitism is an element of human existence...and therefore we are obliged to fight it every day." Making a call for future action, Schulz said that there is a "wonderful obligation for all of us" to listen to survivors of the Holocaust and become witnesses, and then pass on that testimony to the next generation. "If you want a better future, you have no right to forget atrocities of the past," he concluded.